A continuation from last week’s article on the basics and why I chose the hybrid alternative system. This past week I bought the cable and the connectors to connect the batteries, firstly to each other and then to the hybrid inverter. As I mentioned, I wanted 200Ah batteries, in which case for this 48V hybrid inverter I would have needed 4 connected in series. However, that was not possible and I ended up with 8x100Ah batteries, which means that I will need to connect 2 sets in parallel of the 4 x batteries in series. Basically the 4 100Ah batteries connected in series to give me the 48V at 100Ah and then duplicate this in parallel, giving me the 48V at 200Ah. 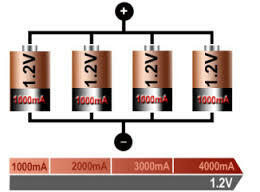 To increase the overall voltage of a group of batteries, connect them in series, to increase the overall amperage, connect them in parallel. Getting the cable crimping tool to make all the joining cables and arranging for the electrician to come and quote on the job of connecting all of this to the electricity distribution board in our kitchen. The cost of the 6m of 35mm (squared) welding cable, 18 crimp battery connections and the 100Amp DC fuse and holder came to R776.68 from Current Automation. Update on Monday 20th July 2015 – So the battery terminals are done, the RCT5000 has been installed on the wall and batteries have found a good home on the well ventilated plastic filing shelf – the filing shelf was my wife’s idea, I was about to haul out the table saw and to start manufacturing a wooden stand. This plastic one is far better though as it has brilliant ventilation and rather robust, having said that the centre needed propping up as the batteries weigh a ton and the middle sagged just a touch. Above: We installed the unit in the garage, as it would take up too much valuable space in the house. As you can see, I could not wait for the installation to be 100% complete before testing the backup side of the inverter and therefore the extension cords, one to power the RCT5000 and charge the batteries and the other to use as the extension cord to connect devices inside the house. And as we were scheduled for load shedding yesterday, I was really chuffed with myself and eager to give Eksdom the finger when they cut the power. But, alas, they skipped the load shedding and I had to do a simulation – which worked perfectly. I watched about 3 hours of video, using the HD LED 42″ TV, media center, media PC, external drive and a energy efficient light. It seemed to use about a quarter of the battery capacity – with those devices I was using 300W. You can also see my midway props to stop the sagging 😉 The conduit on the left has nothing to do with this installation. Above: Each battery bank of 4 x 100Ah batteries has a 100Amp DC fuse – monsters – this is to protect each bank of batteries and also the inverter, if something goes wrong on the battery side or from the inverter. Some people only have one for the two banks, others believe it should have one per battery, but I thought this was sufficient protection. Also from my reading the friendly manual, it seems I may need a manual switch between the battery bank and the inverter. 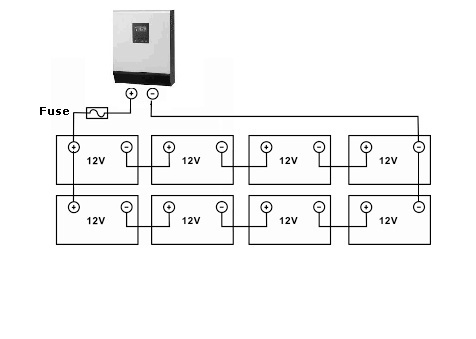 Above: The 4 batteries connected in series, with the exact duplication of another four below and the two banks connected in parallel to each other and then the inverter. Above: The 35mm squared cables that I made by crimping the connectors (thanks Stephen for the loan of the cable crimping tool) and then soldered the cable and the connector together to make a solid connection on all ends. I then used coloured insolation tape to indicate positive and negative connections. Making the cables yourself allows you to have cables that are the perfect length and also minimises the voltage drop in the unnecessary cable. The next step is to wait for the electrician to wire separate circuits for the inverter/solar power and install sub-distribution boards so that we use as little of Eksdom as possible. The idea is that during sunny days, the solar panels will provide enough power to cover our dedicated circuits and at night we will rely on the batteries and when those cannot cope, we will switch over to Eksdom. Things like pool pumps, fridges, stoves and geysers we have left out of the equation for now. The geyser will change to a solar or gas unit. Solar panels ordered and waiting to be collected, once we have them we will look at the angle needed and the best location on the roof and get them installed. Solar power is indeed becoming more popular these days because of the benefits it gives them to every household. No doubt about it and it’s ca good solution for having efficient energy for your home.